Posted under Health Guides. Updated 14 February 2018. Eye injuries can happen very quickly and can cause permanent damage to your vision. The good news is that most eye injuries can be prevented. Eye injuries include damage to any part of your eye, lid and area around your eye. Wear sunglasses every time you go outside to protect your eyes from ultraviolet (UV) rays. Check the label on your sunglasses and make sure it blocks 100% UV-A and UV-B. Chronic exposure to sunlight over your lifetime can cause damage to your eyes. Wear eye goggles when playing certain sports, working with tools, using chemicals, basically any activity that could cause an object such as a hockey stick, tennis ball, or chemical to enter your eye. “20-20-20 rule”. Look away from the screen every 20 minutes at an object 20 feet away for 20 seconds. Eat lots of fruits and vegetables, especially citrus fruits and dark leafy greens. Oranges, grapefruit, spinach, kale, and collard greens are good for eye health. Nuts, and fish such as salmon and tuna also keep your eyes healthy. Exercise regularly. Exercise brings oxygen and blood to the eyes, which keeps eyes healthy. Get a good night’s sleep. Get at least 8-9 hours of sleep every night. Sleep keeps the eyes moist and flushes out irritants. Don’t smoke. Smoking can lead to eye diseases. Not smoking or quitting smoking is important to eye health. 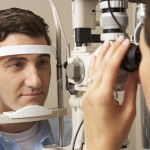 How can I prevent eye injuries? Most eye injuries are prevented by wearing protective eyewear, which is specifically made to protect your eyes during certain activities and while playing sports. More than 90% of eye injuries are prevented by wearing protective eyewear. Protective eyewear is durable, functional glasses with non-breakable lenses that vary in their design depending on what type of activity they are used for. Choosing the right protective eyewear depends on the activity. Some examples of protective eyewear are sports goggles and safety glasses. Although they may improve your vision, regular eyeglasses are not considered protective eyewear. How do I choose the right protective eyewear? Talk to your eye specialist, parent(s) or guardian(s), coach, or teacher to find out what type of eyewear you should have. The American National Standards Institute (ANSI) or the American Society for Testing and Materials (ASTM) tests protective eyewear to see if it meets safety standards. Look for eyewear with ANSI or ASTM marked either on the frame, lenses, or packaging. Making a woodblock in art class, performing an experiment in chemistry class, helping with home improvements, gardening in the backyard. The next time you’re doing these activities, protect your eyes and wear safety glasses. Safety glasses protect your eyes against anything that may come in contact with your eye by mistake as well as chemicals, and flying particles. The safety glasses are usually larger and more durable than regular eyeglasses. You may be able to wear your eyeglasses under the safety glasses, if they fit. If they don’t, ask your eye specialist if you can get prescription safety glasses. Find ANSI approved safety glasses at hardware stores or school. Many teens are injured during sports. Most eye injuries are prevented by wearing sports goggles, also called sports eye guards. Goggles should be worn at all times for high risk sports: paintball, lacrosse, racquet sports such as tennis, football, baseball, basketball, and hockey. Sports goggles have large, durable lenses or metal cages that resist breaking on impact. They may have a strap that wraps around the back of the head to keep the goggles in place. The earpieces are coated in rubber for added comfort and protection. Your eye specialist can give you a prescription for goggles if you wear glasses. When playing sports that have a high risk of eye injuries, sports goggles should be worn with other types of eye protection. Face shields (sheet of polycarbonate) and wire masks (metal cages) offer added protection by attaching directly to a helmet and covering most or all of the face. Choosing the best eye protection depends on the sports activity. See the table below for a list of ASTM tested sports equipment. Only purchase equipment with their seal. Eye injuries can be very serious. Go to the closest emergency room and follow these important first aid tips. Don’t try to remove an object from the eye. Try blinking. If this doesn’t work, go to the emergency room. Don’t touch an injured eye. Applying pressure or rubbing could make it worse. Flush your eyes out with water for 15-20 minutes if you get a chemical or other liquid irritant in your eye. If you wear contact lenses, remove them right away.